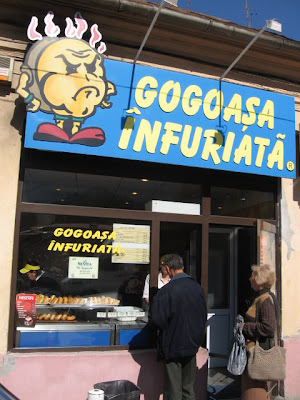 Gogoasa Infuriata means "angry donut" in Romanian, or, if you will, "hot donut." Regardless of what Romania may have or have not contributed to the developement of Western Civilization, any lack is more than made up for by their Angry Donuts. This is quite possibly the best fast food franchise located on the planet earth. I'm not prone to hyperbole, but this modest Romanian donut franchise puts Dunkin Donuts or Krispy Kreme to shame. 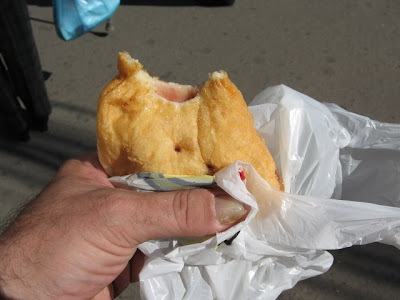 Yes, I can rant on and on about ciorba de burta and other Romanian dishes, but what I dream about is a nice hot, fresh donut filled with sour cherry jam or vanilla cream and a steaming cup of coffee next to the vegetable market in Cluj -Napoca, Romania. Kolozsvár for our Magyar friends. Kloysenberg for the Yiddish speakers, Kokosvar for the Rroma among us. Donut Capital of the World for the rest of you. Seriously - I don't have any kind of sweet tooth, I could care less about desserts or fine chocolates, but I have a major craving for these donuts. I get of the train from Budapest and I need my fix. I wake up horribly hungover in the morning ready for a hike to the market square, I don't care how far it is... hmmmm... angry donuts....coffee... It's all about quality in a country where nobody ever cared about food quality outside of the narrow domestic sphere. 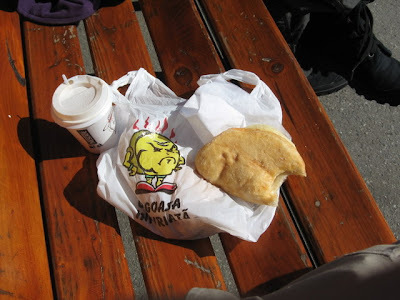 Angry Donuts are so good it comes as a shock to Romanians used to eating placinta that have been sitting in a kiosk window for three or four hours until they are hard and cold as a rock. 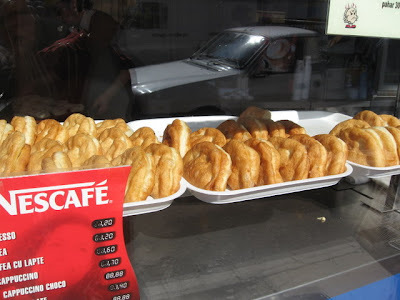 It also comes as a shock to foreign visitors who have never had a donut so good, and who have already accustomed themselves to tripe soup for breakfast. These, however, are made fresh in small batches and tossed warm in sugar before being served. 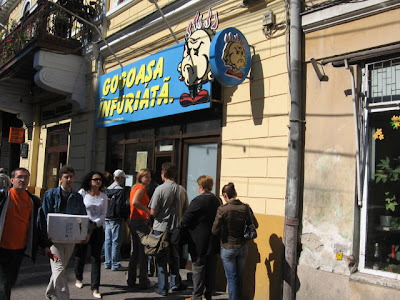 At one lei a donut (about 30 EU cents) it is one of the most astounding culinary bargains in the European Union.There are several Gogoasa Infuriata franchises thoughout Romania, including several in Bucharest, Craiova, and apparently three in Cluj. These would easily make a dent in any mall in the United States or Britain, where the little doughy bread bombs would be recieved warmly by the power-snacking hordes of the West. The idea is so simple these could easily be a hit anywhere in the world - keeping the batches small means every donut is fresh and warm, and the menu is short: donuts filled with apples, sour cherry jam, vanilla or chocoalte cream, or salty cheese. The coffee is of a type rare in Europe: regular good old filter coffee served in a take away paper cup. You know it has to be good because there is always a line out in front. Angry Donuts are easy to find - one is on str. Memorandului on the main square at Piata Unirii, while the other is tucked on a side street next to the main outdoor market at Mihai Viteazu Square. I also appreciated the "Gogoasa infuriata!" its taste is far reacher in intensity than a normal Gogoasa:)! 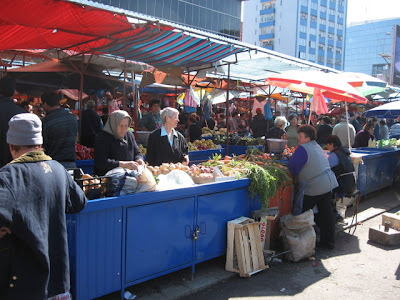 I will be travelling to Cluj regularly since the beginning of the new year to continue my research (gopk.blogspot.com). For the moment I am living in Budapest. Damn. Good sushi and donuts in Cluj?!?! I had no idea. Next time I head over there from Oradea to see my sister-in-law, I'll check both places out. If Gogoasa Infuriata is better than Spud-nuts from El Dorado, Arkansas, I'll be ecstatic. i love those donuts!!!!! I used to eat them all the time!! !